For drying, bake out, Digital, 3 Aluminum Shelves Included. 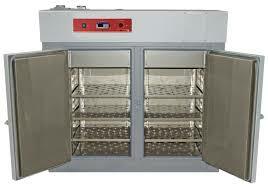 All Shel Lab Vacuum Ovens are built with a 304 stainless steel chamber for exceptional durability. Durable construction with seamless welds and strong bracing. We use true vacuum valves built of brass that use Teflon seats to prevent leaks. Our double plenum design exceeds CE safety requirements resulting in a cool outer surface. Versatile – Chose from 3/8 inch orifice or a KF25 fitting to withstand heavy use, minimize draw-down time and achieve low vacuum levels. We offer a full line of gaskets to suit applications involving high temperatures, acids, or solvents.